Topics: Services, Class Schedule, and Applications For Doi. It has 4 nameservers, including ns8.san.yahoo.com, ns9.san.yahoo.com, and yns1.yahoo.com. It is hosted by Yahoo Inc (California, Sunnyvale,) using YTS/1 web server. 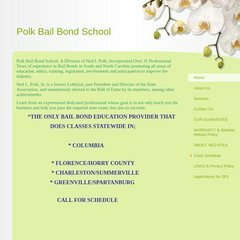 Polkbailbondschool.com's IP address is 98.139.134.174.